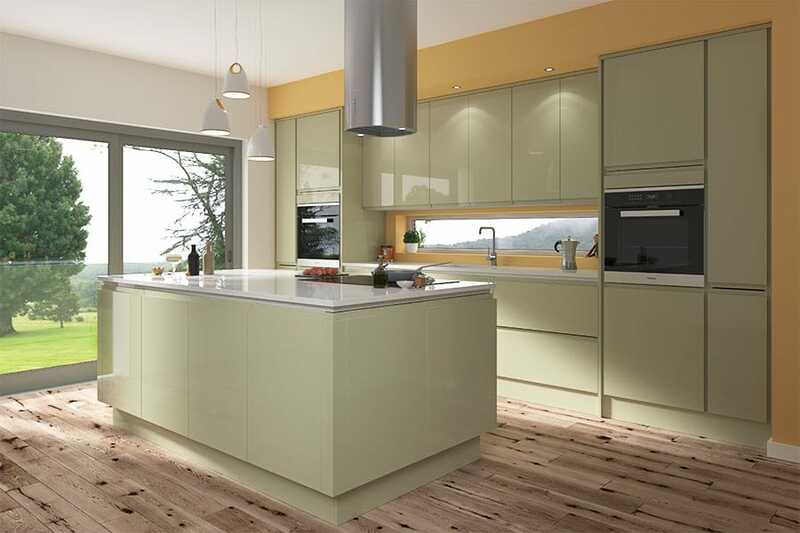 This is an Innova Luca High Gloss Sage Handleless kitchen solution. Manufactured with a 22mm MDF door and finished with a high gloss polyurethane lacquer. The Luca high gloss range is currently available in White, Alabaster, Dove Grey, Sky Blue, Sage, Cashmere & Graphite. With its clean lines and smooth appearance, this kitchen will bring a touch of class to any home. The process of finishing a true gloss kitchen door involves applying a high build polyester primer to the surface, sanding it, then applying a gloss polyurethane lacquer. Finally, some more sanding is required then buffing & polishing with compounds and waxes to achieve that glossy finish. Having found the style we wanted on the web site, and being impressed by the range of units and fittings available, we decided to visit the showroom to see for ourselves whether the reality matched the promise. And it did. Like several other contributors, we had looked at various high street sources before finding DIY Kitchens, and found the others were offering a restricted range at inflated prices. We saw the units we were interested in (Luca Gloss Sage), were impressed by the build quality, and decided they were what we wanted. We got some great advice from the showroom team, too, about how to achieve what we needed to fit some tricky shapes and non-standard sizes. As we were fitting the kitchen ourselves, that wasn?t a problem in the end, due to being able to order units ?dry assembled? so we could reduce their depth, or otherwise modify them to suit our space. As a result we?ve been able to maximise our storage space while retaining a coordinated look. We also built our own walk-in corner pantry - we selected appropriate doors to match to match the units, and designed the pantry to suit the doors, and it has all worked very well. While at the showroom we also chose the worktop we wanted (Silestone Zirconium Quartz) which looks great with the sage green units. The guys from Natural Stone Surfaces did a good job of fitting everything. The ?shark?s nose? profile works extremely well with the handleless doors, and we are especially pleased with the recessed sink drainer ? beautifully executed. All in all, we have been very impressed by the whole package. A few minor issues with incorrect items being delivered were quickly sorted out and the quality you get for the price is outstanding. I am extremely impressed with the style and quality of our new kitchen we would definitely recommend DIY kitchens to anybody looking to fit a new kitchen. I am extremely impressed by the quality of the kitchen which is solid and sturdy. The drawers open smoothly and the corner cupboard carousels are strong and safe. The worktops are beautifully finished and impressively fitted, I would highly recommend the granite worktops. We also had glass splashbacks fitted and they completely finish the look. The overall effect is just what I was looking for – and I had looked at many kitchen suppliers. I found DIY kitchens online while searching for someone who would do the colour I was looking for (sage green) in a high gloss finish. I placed my order after a visit to the showroom where the very helpful staff ensured that my order was correct by filling my online basket for me with everything I needed. 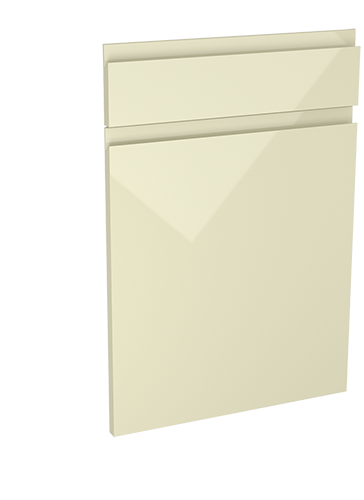 Order a Luca Gloss Sage door sample pack Pack contains x 1 355mm x 297mm 'Luca Gloss Sage' door. Fully refundable when placing a full kitchen order. There's no risk to you, we'll collect and refund the samples once you have finished with them.